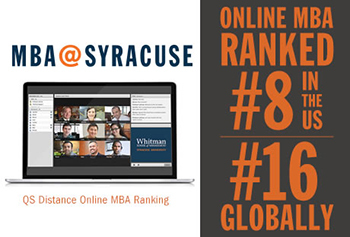 The Whitman School‘s online MBA program, MBA@Syracuse, has been ranked #8 in the U.S. and #16 globally, in the QS Distance Online M.B.A. Ranking, improving from #25 globally in 2014. The full QS Distance Online M.B.A. Ranking 2015 can be viewed on http://www.TopMBA.com/onlineMBA. The Whitman School recently launched MBA@Syracuse, its newly enhanced online M.B.A. degree program delivered in partnership with 2U Inc. MBA@Syracuse allows students from anywhere in the world to take part in the highly regarded Whitman M.B.A. program without having to relocate or put their careers on hold. Classes take place on a live, online platform taught by Whitman’s award-winning faculty, as well as multi-day domestic and international residencies connecting students with the comprehensive education and experience they need to succeed in today’s competitive business environment. The QS Distance Online M.B.A. Ranking evaluates accredited online and distance learning M.B.A. programs. The ranking methodology assesses online M.B.A. programs across six areas: employability, student quality, the program’s establishment in the online M.B.A. market, faculty and teaching, class experience and diversity. A total of 25 schools are included in the ranking.